Pharmacy Technicians are trained healthcare professionals who work under the direction of a licensed pharmacist. In hospitals, clinics, and retail pharmacies, they issue medications, process insurance claims, maintain inventory, label and store supplies, compound sterile preparations, and attend to customer service issues. As the medical community increasingly rely on pharmacy technicians to assistant pharmacists with the distribution of healthcare products and educate patients, the Bureau of Labor Statistics estimates that employment will only increase in response to advances in healthcare, the wider distribution of drugs, and the increasing healthcare needs of an aging population. The pharmacy technician program at CCBC prepares students for success on the national PTCB exam to become a Certified Pharmacy Technician. Applicants must possess a high school diploma or GED and be computer literate and have access to the Internet. Once enrolled, students must complete the prerequisite courses – Medical Terminology for Health Occupations, Anatomy and Physiology, Basic Math for Health Care, CPR for Health Care Providers, and HIPAA Training. The First Aid, HIPAA Training, and CPR require 100% attendance. Students who arrive late, leave early, or miss the class will receive a failing grade and no refund. Other course modules (core) include Pharmacy Tech I and II, Introduction to Electronic Health Records, Compounding Sterile Preparations, Pharmacy Technician Externship, and PTCB Exam Review. Tuition for the program is $4,177, including fees, plus $471.87 for books and supplies. Students enrolled in the pharmacy technician program at Fortis learn to read, fill, and distribute prescriptions. They also gain an understanding of basic pharmaceutical calculations and common drug interactions and their side effects. The program consists of 760 clock hours, including 160 externship hours, covered in 36 instructional weeks. Students earn 35.5 credit hours at the conclusion of the program. The topics covered in the program include computer software applications, microbiology, drug classification, drug preparation, foundations of clinical pharmacology, drug preparations, body systems, drug therapy and administration of medications, pharmacology calculations, body systems, IV solution preparation, and pharmacy technician externship. Day students meet Monday through Thursday from 9:00 am to 2:00 pm. Evening students meet Monday through Thursday from 6:00 to 10:30 pm. Tuition for the program is $14,929 plus $672 for books and supplies. The cost includes the Maryland Board of Pharmacy (MBP) exam fee, which is required for registration. The 10-week pharmacy technician program at Gandhi Health Career Services includes a total of 268 contact hours. Students spend 72 hours in the classroom – Monday, Wednesday, and Friday – 36 hours in the lab, including 5 hours of CPR training, and 160 hours – 4 weeks – in a clinical externship. Course topics include pharmacology, pharmacy calculations, preparing and dispensing medications, identifying common drugs, medical terminology, body systems, and IV solution preparations. To graduate from the program, students must attend 90% or above of the theory, attend 100% of the clinical experience, and earn a passing score of 80% or above on all assessments. Graduates will receive a certificate of completion and have the confidence to succeed on the national PTCB exam or the MBP state exam. Tuition for the program is $1,700. Application for entry to the pharmacy technician program at Caroline Center is considered on a first-come first served basis. Students learn the role and responsibilities of the pharmacy technician, how a pharmacy works, use of reference guides, deciphering prescriptions, aseptic techniques and working under a pharmacy hood, compounding medications and sterile preparations, over-the-counter medications, legal and ethical issues related to drugs and medications, and pharmaceutical calculations. 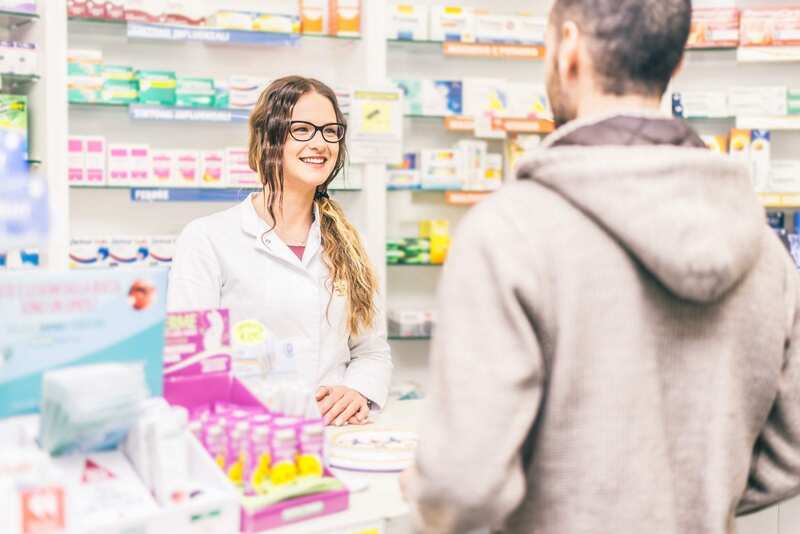 A supervised clinical experience, included in the training, give students opportunities to model pharmacy technician experience through 120 hours of practice in a retail pharmacy. Graduates are encouraged to take the national certification exam to become a Certified Pharmacy Technician. Applicants must be a Baltimore City resident, 20 years or older, drug and alcohol-free, possess a high school diploma or GED, complete the TABE Locator reading and math test, and attend an interview with Caroline Center. All students must undergo a background check. Tuition is $4,000 per person. However, due to donations and funding, students pay only $250 to complete the pharmacy technician program. The Pharmacy Tech program at Stein Academy features 260 hours of classroom lectures, hands-on lab, and clinical externship in an approved pharmacy. Students cover essential topics during 100 lecture hours in the classroom followed by the state-mandated 160-hour externship. Applicants must provide proof of successfully completing high school (proof of current enrollment in high school or written proof of pharmacy work are also acceptable), a valid social security number, proof of TB test, a physical exam report from a physician, a drug test report (not older than 6 months), proof of health insurance coverage, and access to a computer and internet. Students must be 17 years or older by the first day of class and possess up-to-date immunizations and CPR certification. Tuition and lab fees cost $2,625. Students must also pay a non-refundable registration fee of $50. Additional costs include uniform, books, and clinical supplies and equipment. The pharmacy technician diploma program at All-State Career prepares students for entry-level employment as a pharmacy technician in hospitals, retail pharmacies, and clinics. The curriculum consists of 760 hours of instruction – 600 hours in the classroom and 160 hours of clinical externship. The duration of the program, for both day and evening schedules, is 36 weeks, including 6 weeks for the clinical externship. Course topics include drug preparation, microbiology, foundations of clinical pharmacology, microbiology, drug preparation, IV Solution preparation, body systems, drug classification, pharmacology calculations, and computer software applications. Applicants must attend an information session, possess a high school diploma or GED, and attend a personal evaluation. Tuition for the program is $14,627 plus $400 for books and supplies. The pharmacy technician program, offered by the Continuing Education Department at BCCC has the approval of the Maryland Board of Pharmacy. The training comprises of 272 hours of instruction in the classroom and clinical setting to equip participants with the key skills to improve their employment prospects. CPR, pharmacy calculations, pharmacy technician theory, and pharmacy technician clinical are the main course modules. Applicants must possess a high school diploma or GED, a negative TB skin test or clear chest x-ray, a passing score on a math and reading assessment, and obtain clearance on a background check and drug screen. Students who successfully complete the program may take the optional PTCB national exam. Tuition for the program is $$1,363 plus expenses for books and supplies. Qualified faculty members prepare pharmacy technician students at Brightwood College with the skills to stand out to local employers. The curriculum emphasizes interpersonal and communication skills that employers seek. The training includes classroom lectures and hands-on practical experiences in a local pharmacy. Students learn sterile product preparations, pharmacy compounding, inventory control, computer applications, prescription order processing and filling, pharmacy law and regulations, and communication skills. Instructors also cover stocking procedures, generic names of medications, first aid, CPR, and handling outdated items. There are 760 hours included in the program covered in a 36-week duration. Students earn 55-quarter credit at the program’s conclusion. Tuition for the program is $15,126. Books and equipment cost an additional $975. Maryland Center for Adult Training provides pharmacy technician students with the communication, patient advocacy, and safety skills to acquire entry-level employment as a pharmacy technician in a wide variety of settings. Students learn how to prepare and distribute medications, label and fill orders, maintain records, and support pharmacists with other activities in the pharmacy. A key component of the program is to help students make the distinction between the role of the pharmacist and the pharmacy technician. Graduates can apply for the PTCB exam and registration in the State of Maryland. The pharmacy technician program at Elizabeth Seton is accredited by the Maryland State Board of Nursing. The college preparatory program involves learning the in the classroom as well as clinical training. Through collaboration with Notre Dame University, pharmacy technician students are able to learn the latest skills at the Pharmacy Labs in Notre Dame. The program’s qualified instructor presents the program in such as way to help students develop an interest in the healthcare profession, gain a basic understanding of drugs and the workings of the healthcare system, become better informed about the importance of drug therapy in controlling diseases, and understand the financial and emotional rewards of a career in health. Graduates can apply for the PTCE to become a Certified Pharmacy Technician.